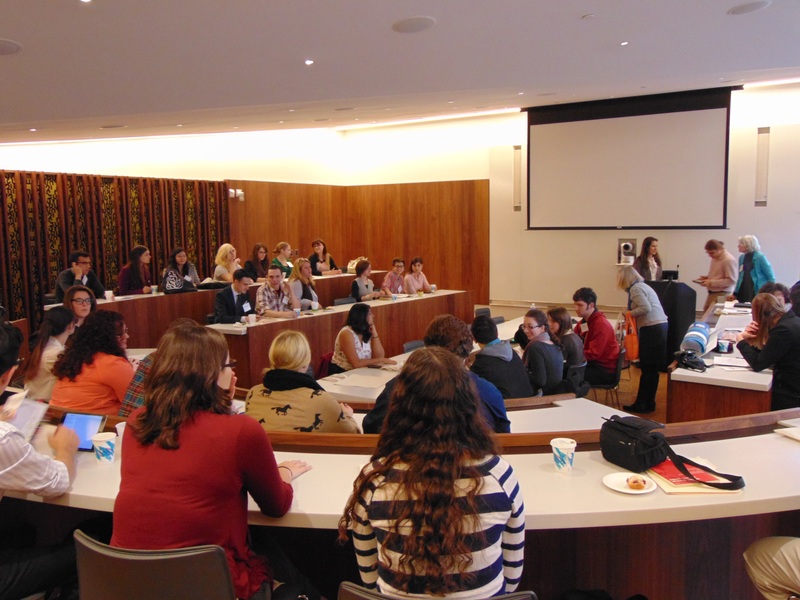 The gathering of undergraduate editors at the 2014 FUSE conference at Bennington College in Bennington, VT. The FUSE conference, which took place at Bennington College in Vermont this November, was a unique opportunity to interact with like-minded people who aim to produce excellent literary journals. FUSE, or the Forum for Undergraduate Student Editors, is a national organization that serves to connect student editors from schools across the nation, giving them the chance to share ideas, offer advice, and support each other in their endeavors. The conference consisted of presentations by students, faculty, and guest speakers about editing, publishing, and other general concepts related to creating a literary journal with undergraduates. There was also time set aside for attendees to take a look at the various journals being represented, and to show their own. Autumn Heisler, editor-in-chief of Widener Ink (left) and Emily DeFreitas, editor-in-chief of The Blue Route (right) present on community outreach during the conference. While there, I had the opportunity to take part in a presentation on community outreach, but more importantly, I was able to listen to the thoughts, ideas, and strategies of other literary journals. I came out of the event with a substantial list of things The Blue Route staff should consider doing in the future, and I suspect that editors from other schools did as well. As one of the speakers pointed out, the main competition for a literary journal isn’t other literary journals. In reality, we compete with the distractions of the electronic world around us as we attempt to reel in readers. Because of this, having a network through which we can promote each other, encourage readership, and improve the individual journals we’re producing is an extremely valuable thing. 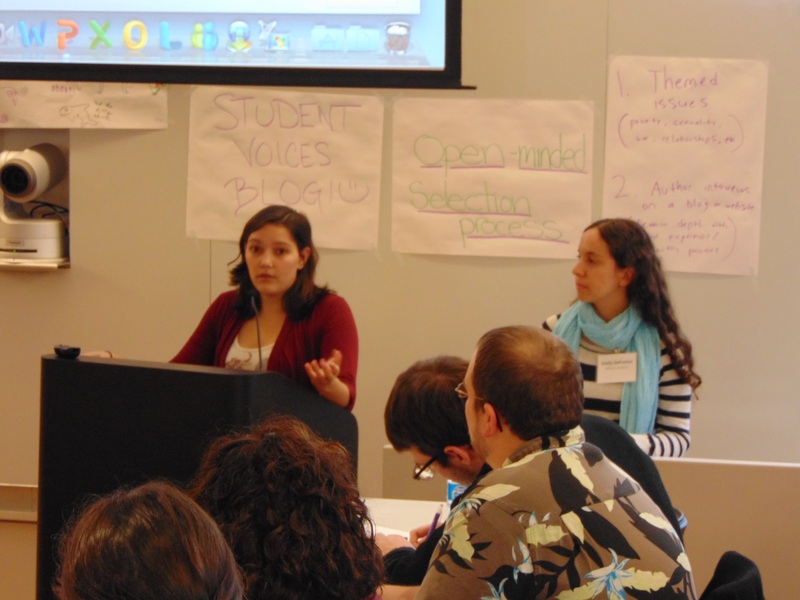 Some of the ideas presented were not necessarily specific to literary journals alone. Some might be well applied to groups like Widener’s own English Club. Students talked about write-ins, open mics, and blind dates with books, all of which are fantastic ways to participate in the literary world, building a reading and writing community in person, not just online or on paper. This conference was meant to assist in building that community. Throughout the event it became clear that there are many ways to do that, and literary journals play an important role. This entry was posted in Uncategorized and tagged College, Editing, FUSE, FUSE 2014, Literary Community, Literature, Publishing, Reading, Student work, Undergraduate literary journal, Undergraduate Writing, Writing on November 16, 2014 by edefreitas.